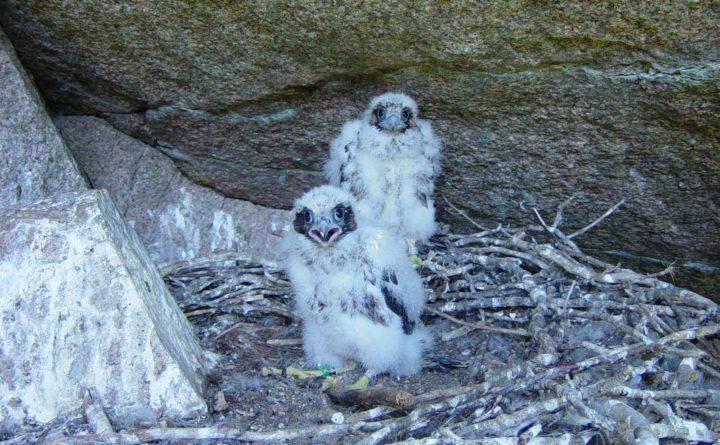 Two peregrine falcon chicks face off with a park photographer at a nesting site near Precipice Trail in Acadia National Park in this 2008 file photo. Peregrine falcons are one of several species expected to benefit from the Woodward Point preservation effort. BRUNSWICK, Maine — Maine will receive $570,000 in federal funding to help preserve 96 acres at Woodward Point, protecting wetlands and buffering uplands in northern Casco Bay. The funding will allow the Maine Department of Inland Fisheries and Wildlife and the Maine Coast Heritage Trust to acquire the area, which is a designated estuary of national significance and “cradles” all of one and part of a second commercially important shellfish beds, according to a release from U.S. Rep. Chellie Pingree, D-Maine. “Thanks to the Coastal Wetland Conservation Program, administered by the U.S. Fish and Wildlife Service, and other state and local partnerships, this area of northern Casco Bay will be capable of supporting hiking, paddling, picnicking, hunting, and shellfish harvesting for generations to come,” Pingree said in the release. The site contains 42.8 acres of decreasing or stable coastal wetlands, including 3.82 acres of fringing salt marsh and 38.12 acres of mud flats, as well as 53.4 upland acres of fields, woods and a pond, according to the U.S. Fish and Wildlife Service. There is also 1,600 feet of tributary streams that drain into Woodward Cove and intertidal habitats. The mudflats in the project area consistently produce some of the highest shellfish landings in the Casco Bay region, according to the release. “The conservation of the Woodward Point parcel will protect the long-term viability of the mud flats both from an ecological and economic standpoint,” the release states. Federal and state listed species that can benefit include the Northern long-eared bat, rusty patched bumble bee, black-crowned night heron, peregrine falcon and Barrow’s goldeneye. The project will also create opportunities for recreational uses, such as exploring and learning about coastal wetlands habitats.